Mountain Chief of Piegan Blackfeet making phonographic record at Smithsonian. The interviewer is ethnologist Frances Densmore. 1916. 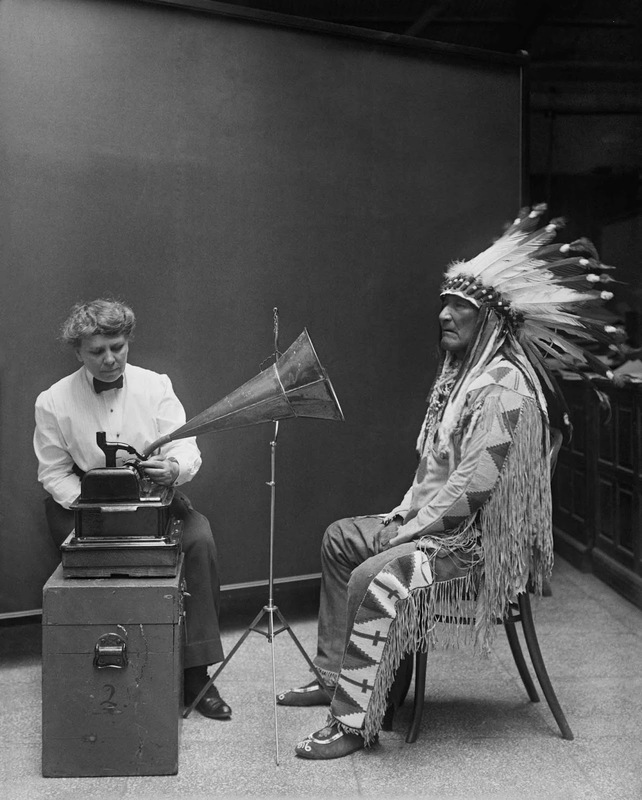 Although the photo was probably staged, it does show anthropologist Frances Densmore sitting with Mountain Chief of the Blackfoot Indian tribe, while he interprets a song in Plains Indian sign language. The photo was taken for the Bureau of American Ethnology at the Smithsonian Institute on February 9, 1916. Mountain Chief was a Blackfoot leader of the 19th century. He belonged to the Kainai or Blood tribe of the Blackfoot Confederacy. His Blackfoot name was Ninna-stako (also spelled Ninastoko, Nina-istako, Ninaa-iistako, Ninaiistako, and other ways), and was a reference to the name of an important mountain in the traditional territory of his band. Mountain Chief began his career as a warrior leader in 1866 at age eighteen, when he led a Blackfoot war party against the Crows at Cypress Hills. In an 1873 battle against the Crow, he was badly wounded in one of his legs. Ninastoko limped for the rest of his life. Although aggressive in the face of the Blackfoot’s traditional native enemies, Mountain Chief was more accommodating to immigrating Euro-Americans. During his work as a negotiator, Mountain Chief met four US presidents-McKinley, Taft, Theodore Roosevelt, and Wilson. He also worked with General Hugh L. Scott for several years to record Plains Indians’ sign languages. Ninastoko went blind late in life and died in 1942 at age ninety-four at his home in Blood Indian Reserve, Montana.